Energy Deregulation: If you have the option to choose your own energy source, choose green! Be responsible to our environment and future generations! September 29, 2014—-Energy Deregulation is the ability of energy consumers to choose their electricity service or gas service from the company of their choice (called retail electric and gas providers or REPs). The local utilities company still owns and maintains the local power system and transfers energy and gas through their grid to your house. Your state has a choice to: Deregulate completely, partially, try deregulation out using a pilot program, or to not deregulate at all. Some states have deregulated gas usage and some have deregulated electricity. It’s a mixed bag at this point. The Federal Energy Regulation Commission, FERC, is the federal agency responsible for regulating the transmission of electricity, natural gas and oil since about 1920. Twenty years ago, FERC began to clear the way for states to determine if and how they should allow retail price competition, removing government rules and regulations, and allowing states to use the free market to set the prices of gas and electricity. It cleared the way to dismantle the monopoly of your local utility company. FERC eliminated government control over how business is done, but still regulates fraud. 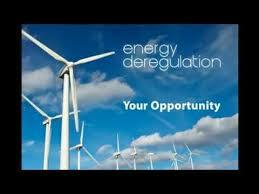 Deregulation Gives the Consumer Energy Choices. California deregulated in 1998, and it didn’t work. Prices skyrocketed! David Freeman, energy adviser to the governor, stated, “California’s earlier approach to deregulation didn’t work. It was not carefully thought through. It was sort of sloppy policy-by analogy to other things that had been done, and it didn’t work. That doesn’t mean that electricity deregulation can’t work!” Thus, the caution by states currently trying pilot programs to deregulate. Thirty states have some kind of energy deregulation: Partial deregulation–California, Connecticut, Delaware, Maine, Massachusetts, New Hampshire, New Mexico, West Virginia, Texas, Rhode Island, Washington. Pilot Programs–Colorado, Florida, Georgia, Illinois, Indiana, Kentucky, Maryland, Michigan, Ohio, Oregon, South Dakota, Virginia, Wyoming, Montana, Nebraska. Complete Deregulation–New York, New Jersey, Pennsylvania, Washington D.C.
What are the benefits of deregulation? It creates competition. A well thought out plan will lead to lower prices, and customers can get the best deal. You, as a consumer, can shop for the best prices. When shopping pay attention to suppliers reliability, management and additional fees. Deregulation motivates REP’s (providers) to provide different options–such as renewable energy offered to your grid, clean energy that prevents further pollution of our atmosphere. By your decision you can put clean energy into the grid of your local utility company and reduce the generation of dirty energy. There are many clean energy companies to choose from, find the one which appeals to you by searching the internet. Whatever the cost of the energy you choose, that’s what you will pay. The utility company can only profit from the delivery of the energy. When buying on the free market, the cost will be reflected in the supply portion of your bill. The utilities company won’t shop around for the best prices for you, it’s up to you to find the prices and type of energy you want to use. The energy company you choose makes the profit. This is what creates competition and lower prices than your local utility company can offer. Categories: Climate Change, Energy Programs, Pollution, Renewable Resources | Permalink.